RESEARCH TRIANGLE PARK, NC – We are excited to announce the onboarding of the newest SonoVol employee, Kevin Mottershead. 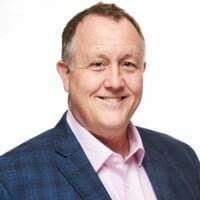 He will serve as VP of Sales and Marketing, and lead commercialization efforts for both Vega and Strata product lines. Kevin is an industry veteran, with over 15 years of experience in commercializing instrumentation and tools within the preclinical disease research and drug development space. We are delighted that Kevin has decided to join our rapidly growing team at SonoVol. 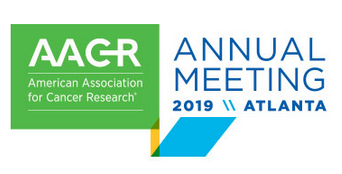 RESEARCH TRIANGLE PARK, NC – We are excited to announce that SonoVol was selected as an exhibitor at this year’s American Association for Cancer Research (AACR) meeting in Atlanta, Georgia. The meeting will run from March 29th to April 3rd and will highlight the latest work in translational oncology research from teams across the world. If you are planning to attend this year’s meeting, please stop by our booth (#4640) to learn about our two product lines, Vega ™ and Strata ™. 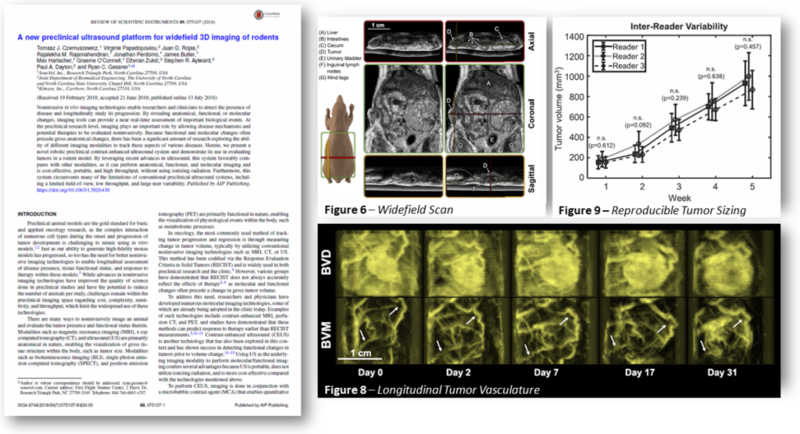 RESEARCH TRIANGLE PARK, NC – SonoVol is excited to announce a recent peer-reviewed publication featuring the Vega platform, “A new preclinical ultrasound platform for widefield 3D imaging of rodents,” in the journal Review of Scientific Instruments. This study by Czernuszewicz et al., describes the underlying technology for the Vega platform and demonstrates the power of utilizing robotically driven ultrasound to capture highly-reproducible longitudinal data in a mouse xenograft model. Tumor-bearing mice were evaluated with the Vega over a period of several weeks using both tissue and vascular imaging modes to monitor the progression of the disease. Results showed that the Vega generated reproducible data across multiple users (regardless of who operated the instrument or who analyzed the data). The Vega can be leveraged for many different types of preclinical research studies, such as non-invasive assessments of cancer or polycystic kidney disease (PKD), said Ryan Gessner Ph.D., SonoVol’s CEO. The article is available for viewing on the publisher’s website. Citation: Czernuszewicz, TJ, et al. “A new preclinical ultrasound platform for widefield 3D imaging of rodents.” Review of Scientific Instruments, 89, no. 7 (2018).  After successfully completing the aims of the Phase I feasibility project, SonoVol has been awarded a Phase II SBIR from the National Institute of Diabetes, Digestive and Kidney Diseases (NIDDK) to continue developing its noninvasive liver disease research platform. This two-year $1.7M Phase II grant is to fund an R&D project entitled “A preclinical multi-modal system for dynamic noninvasive assessment of liver disease”, and will be underway by the end of May, 2018. The project is to be led by grant PI Dr. Tomek Czernuszewicz, and will eventually lead to new research tools deployed on SonoVol’s Vega imaging platform. This new platform will allow four non-invasive technologies to be used nearly simultaneously for a multi-metric assessment of diseased livers: quantitative ultrasound (QUS), shear wave elasticity imaging, Acoustic Angiography™, and targeted molecular imaging. The prototype system will be validated in collaboration with researchers at UC San Diego, Kitware Inc., and UNC Chapel Hill. While the technology will be validated in liver disease, in the future it could be extended to study several others including cancer and cardiovascular disease models, increasing its future impact on the field. 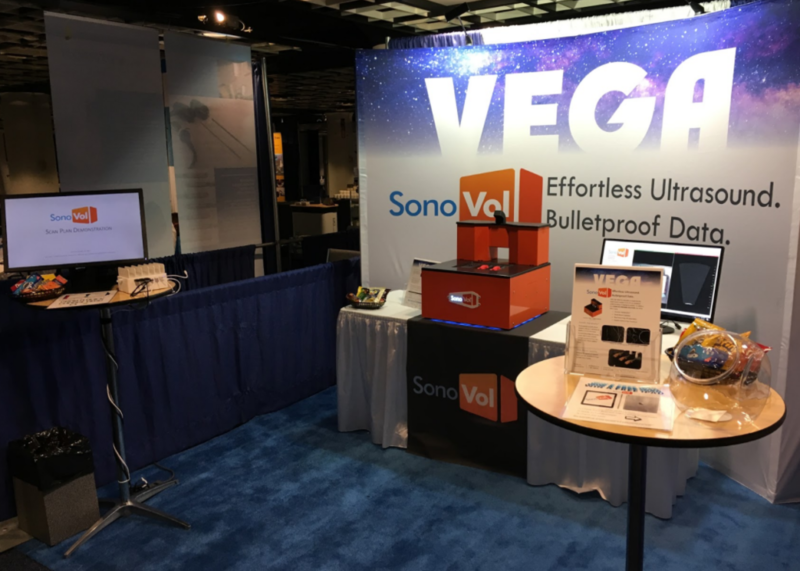 The SonoVol team is excited to announce the successful launch of the Vega imaging platform at the 2017 International Ultrasonics Symposium in Washington DC. The Vega offers a robotic multiplexed workflow with webcam guided hands-free data acquisition for high throughput and user-invariant studies. Additionally, SonoVol’s patented high resolution Acoustic Angiography™ vascular imaging mode, only available on the Vega platform, was featured. This microvascular tumor imaging technology, featured in over 20 publications, allows users to quantitatively assess tumor response to therapy. SonoVol is excited to present at this year’s IEEE IUS meeting in Washington, DC (http://ewh.ieee.org/conf/ius/2017/). Come see us at Booth 27 to see the Vega 100 and register for our iPad giveaway. Additionally, come see our posters and oral presentation on Friday and Saturday. A New Preclinical Ultrasound Imaging Platform for Whole-Body Multiplexed Imaging. Automated System for Point Shearwave Elastography (pSWE) in Rodent Livers. Imaging the Rat Liver and Heart with a 3D Motion Corrected Acoustic Angiography System. SonoVol is excited for the opportunity to present data acquired with its non-invasive tumor imaging system at this year’s American Association of Physicists in Medicine (AAPM) meeting in Denver, Colorado. SonoVol’s poster, entitled “Testing a Tomographic Ultrasound System for Use in Small Animal Radiotherapy Guidance: A Feasibility Study,” will be on display Sunday evening, July 30th from 3 – 6 pm. Stop by and learn how SonoVol’s microvascular tumor imaging can enhance your radiation therapy research! 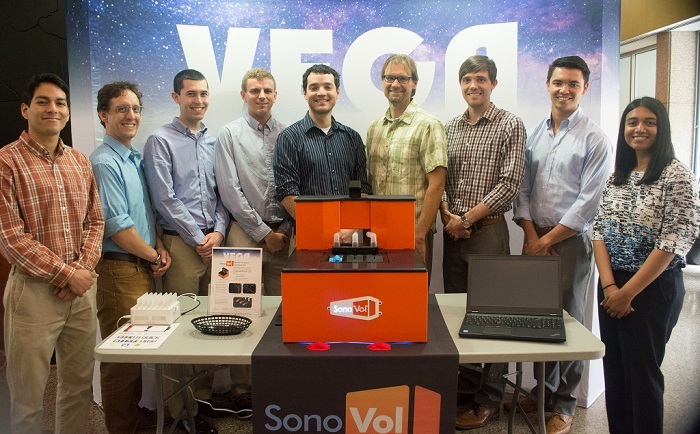 In a continuation of the Phase I pilot study to merge ultrasound and bioluminescence, SonoVol will add photoacoustics to its cancer imaging research platform. This two year $1.8M Phase II R&D project, entitled “Development of a mobile and automated platform for multiplexed multi-modality imaging” will begin within the next month. The system will be validated in collaboration with researchers at Johns Hopkins and UNC Chapel Hill. The device will include clinically translatable imaging approaches for tumor assessment, forming a direct link between preclinical findings and actionable clinical cancer assessment protocols.